THE KILLOUGH/KELLOUGH FAMILY IN IRELAND, CANADA AND THE UNITED STATES. 1997 ed. 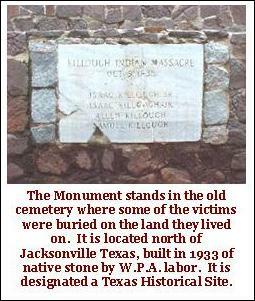 In 1953, John Allen Killough (now deceased) of Stillwater, Oklahoma, wanted to find the place where the 1838 Killough Massacre took place in Texas. In questioning people about it, he found a great deal of interest in this event. This led to the calling of the first meeting in 1955 of Killoughs to the area where the Isaac Killough family lived and some are buried. The sixty-nine families who came enjoyed the event so much that they agreed to invite other Killoughs and get together there annually. Allen had a natural drive to find relatives; he loved to talk to people and compare genealogical information. As he and his wife Louise traveled, during vacations and after retirement, he found that the story of the Killough Massacre had been handed down in numerous Killough families all over the United States. It was an event of common interest and led to many meals and overnight stays with people he'd never seen before but who considered him to be "Killough Kin." Looking over his collection of names, dates and places, his daughter-in-law, Barbara (Mrs. John Allen Killough, Jr.), became interested in the Killough clan, joining him in his search for material and organizing the information he had collected. They considered it important to talk to older members of the family and record their memories of family relationships and events that would be important to later descendants. They learned that Stuart Killough of Pflugerville, Texas, had been collecting Killough information for years, and didn't know what to do with all the loose scraps of paper and old letter she had received in reply to his inquiries. In 1956, all the information was put together in a form that could be distributed to others at the annual reunion, with the expectation that they would make new contributions in the future. That booklet fulfilled its purpose, leading others to explore the roots of the family. In 1969, Stephen Pinckney Killough of Amarillo published an updated genealogy after spending much time and effort contacting as many of the family as he could find. He continued this work and in 1981 reprinted that book along with inserts to show additional data. Along the way, he learned much about early day Scot, Irish and American historical events in which Killoughs would have been involved. His historical essay was included in those two editions. The 1991 edition was compiled, published and distributed for the Killough Reunion Association by Zora Killough Cunningham and John and Barbara Killough. Zora volunteered to continue collecting and organizing new material in preparation for another edition in ten years, but because of a constantly enlarging network of Killoughs and genealogical research being done by computer, too much material became available to wait that long. It is doubtful that a book covering this much ground can be published again. In addition to past publications, sources for the information in this 1997 edition can be found in the raw material held by the compiler for the Killough Association. Eventually this source material will be submitted to a genealogical library in Texas, not yet selected, where it can be accessed by anyone. The information is as accurate as possible, using the personal records, archival data and research submitted by descendants of the original Killough families. We apologize for any errors of transcription. We are deeply appreciative of all who have contributed new information about their families and their research on the Killoughs beyond their own family. 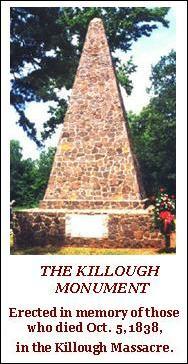 KILLOUGH MASSACRE MEMORIAL SITE, INC.